I’m also dreaming about all the food traditions that go along with Christmas. One of the first things that comes to mind when I think about Christmas is Pillsbury cinnamon rolls. I’m sure a bunch of you have fancy pastries you make for the big morning, but in my family, Christmas morning wasn’t complete without a pan of Pillsbury cinnamon rolls coming out of the oven. As we got older, these cinnamon rolls were complemented with a hot cup of coffee in a Santa mug. And we eventually started adding some fresh fruit and baked oatmeal to go along with it. But one thing always stayed the same, Pillsbury cinnamon rolls. If you read my post a couple weeks ago about my approach to eating, you will see that while I feature mostly healthy, plant-based recipes on my blog and that is what I eat the majority of the time, nothing will be stopping me from enjoying a Pillsbury cinnamon roll, packaged icing and all, this year! Now, if I were to gorge myself full of cinnamon rolls, I’d likely crash within a couple hours (not particularly helpful when I have a SUPER busy 10 month old crawling all around). We will be at my parents for Christmas morning this year and our cinnamon rolls will be served along with some scrambled eggs (protein to help slow the spike in blood sugar), Cranberry Apple Baked Oatmeal (satisfying fiber to fill us up and slow the spike in blood sugar), and some fresh fruit (fiber and vitamins/minerals to round everything out). If you are finding yourself at a loss for what to make this year on Christmas morning, check out these recipes from some fellow healthy recipe bloggers. Trust me, you won’t be disappointed! This Pomegranate Chocolate Chip and Pepita Baked Oatmeal from A Dash of Cinnamon looks PERFECT for the holidays. Pomegranate seeds give it such a festive feel! This Easy Vegetarian Breakfast Casserole from Cozy Peach Kitchen and this Brunch Egg and Veggie Casserole from Your Choice Nutrition look like the perfect make-ahead dish to pop in the oven before gift giving begins! Tofu Scramble Tater Tot Casserole from The Urben Life gives me all the cozy comfort food feels! Spice things up this year by serving this Vegan Huevos Rancheros Casserole from Plant Based Cooking. 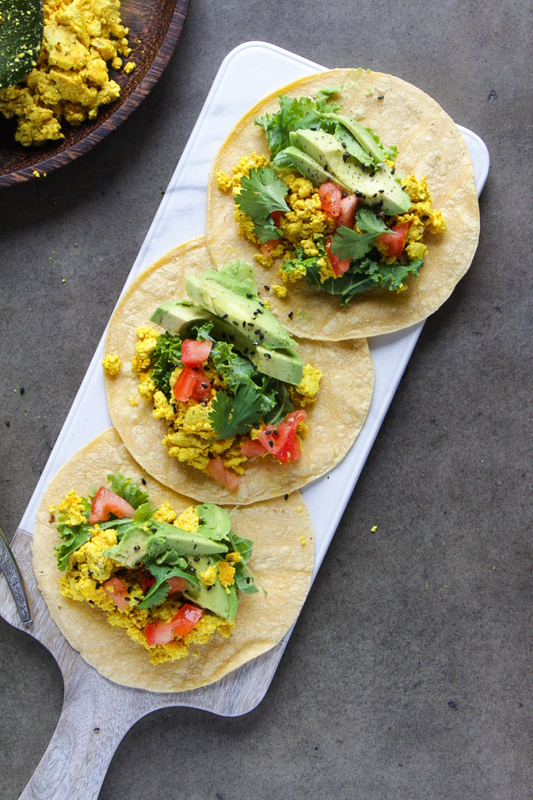 This Vegan Tofu Scramble from Unconventional Cooks would be the perfect base for a build your own taco bar on Christmas morning. Whatever you decide to eat or serve on Christmas morning, I hope you enjoy the day making memories around the table with your loved ones.